Having checked in to Hôtel Louvre Bons Enfants, that first week of August 2014, I freshened up a bit, enjoyed a delicious little glass of the complimentary red wine in my room (Domain Chamfort – extremely appreciated! ), and then stepped out onto the balmy, late-afternoon streets of the 1st Arrondissement of Paris. This is not just any neighborhood (actually, arrondissement, or administrative district) in Paris. Actually, from what I’ve experienced thus far, there is no such thing as “just any neighborhood” anywhere in Paris! In a quest to become acquainted with each of Paris’s 20 arrondissements, I decided this visit to stay in the 1st. Because August typically sees many businesses close and many residents flee what can be stifling heat, I was able to book a room in this rather exclusive district at an affordable rate. And this meant that I was two blocks away from the Louvre. If it weren’t for the high August temperatures, I would not have been able to stay this close to what many consider the pre-eminent museum of the world. From rue des Bons Enfants, I headed left on rue Saint-Honoré then took a right at rue de Marengo – crossing rue de Rivoli – and headed straight into the Louvre’s Cour Carrée. 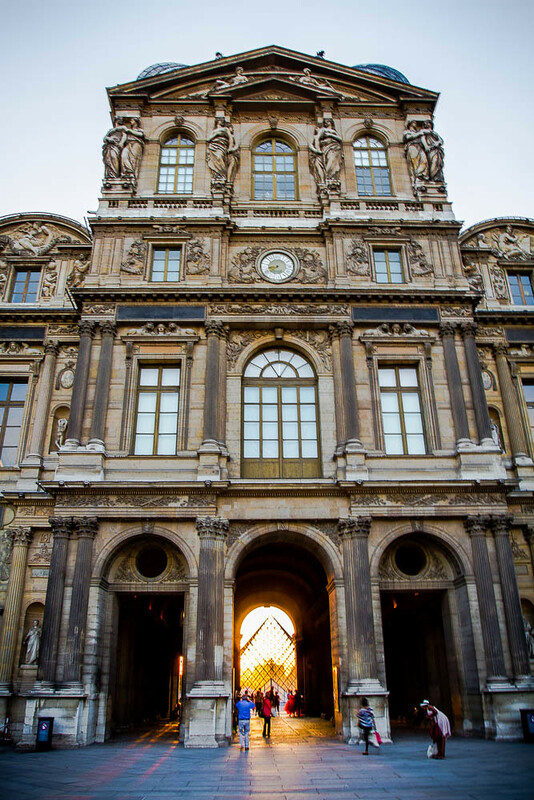 The sun was sliding toward the western horizon and the shadows cast by the Louvre Palace were long and dramatic. A sense of joy and peace pervaded my soul at having arrived here in this place, again, and was made all the more profound by the golden glow of the Paris evening; the warmth of the ebbing day embraced and welcomed me. I could feel myself returning to myself. The Golden Hour timing was perfect for viewing the prismatic sunlight emanating through the Louvre Pyramid and which shone through the Clock Tower passageway between Cour Carrée and Cour Napoléon. And, as I neared the passageway, the pure melody of a flute greeted me. I play the flute! But, I certainly do not play as well as this musician. The notes were lovely and beckoning and were filled with light, like the rest of the world around me. The flutist played “Danny Boy” and I was immediately enchanted. The piece is not an easy one for the flute; I can appreciate the challenge of it. But, he played it so sweetly, holding the notes tenderly and subtly using softness and less softness to carry me away into a bittersweet loveliness of mood. The summer’s gone, and all the flowers dying. ‘Tis you, ’tis you must go, and I must bide. ‘Tis I’ll be here in sunshine or in shadow. And, I was in Paris.